Description: M-531 is an oil-based package of corrosion inhibitors for petroleum and synthetic lubricants. 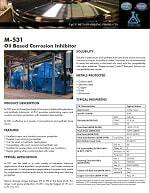 M-531 provides outstanding vapor and contact corrosion protection with excellent demulsibility. M-531 is effective in a variety of conventional and synthetic base stocks. Application: M-531 can be used in a wide variety of industrial lubricant applications where excellent rust protection, and water resistance are required. In rust preventive applications it is particularly useful for coiled steel or stacked parts due to its outstanding non-staining properties. M-531 is available in 5 gallon (19 liter) plastic pails and 55 gallon (208 liter) metal drums. FEATURED IN: Cortec Unveils New Corrosion Inhibitor Featured in Machinery Lubrication!